A structure built as if it were a full scale model for a permanent structure made it possible to move through multiple passages to a courtyard that had previously existed only as an imagined place. 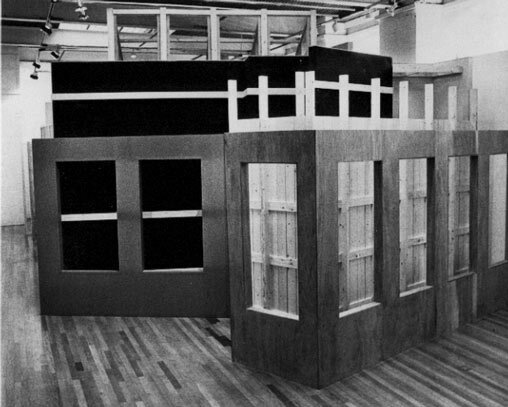 Entering the work is like walking into a three dimensional jig saw puzzle, one that is experienced not just looked at. 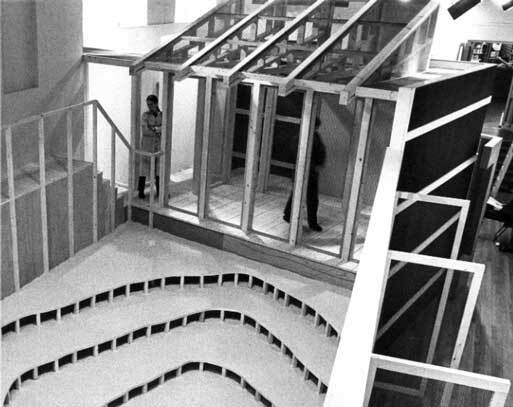 Passages into the structure move between several walls that fold back on themselves like a layered garment; another route passes by screen panels attached to a louvered wall allowing brief glimpses of the interior at certain angles; ladders are placed against a back wall; a wide staircase leads to an elevated walk; a covered passageway arrives at a screened in room. The sense of movement produces the overwhelming experience here. Each step is informed by the previous one and it is necessary to mentally interweave them to understand the relationship of the spaces. They all lead to the central court which is made up of five layers of contoured trays covered in sand; it is as though concentric ripples of water have been frozen. 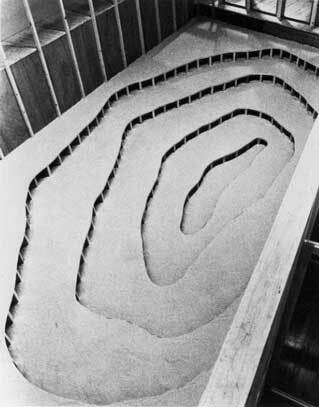 A fabricated ground has been constructed that allows the trays to step down without actual excavation; the structure is carved out to create the space. After the density and physical engagement the viewer is aware of having reached the inside.This is an enclosed, protected place. The contrast between movement and stillness is made palpable.